Qingdao north railway station commenced operation in Jan, 2014. It is situated in Licang District, 7.5 miles (12 kilometers) from the city center, and 7 miles from the Qingdao Liuting International Airport. Since the majority of passenger transport still managed by Qingdao railway station now, there is only a few trains originating from the north station. But in the future, the north station will take over most of the passenger transport of the city. Besides the originating trains run to Harbin, Changchun, Jinan and some other cities, trains through there can reach Beijing, Shanghai, Wuhan, and Nanjing. The station is in a two-story building. The exit and vehicle transfer can be found at Level B1. Whilst boarding is at the first floor, the waiting room is at the second floor. There is only one waiting room in the station which can accommodate 10,000 passengers at any one time, making it convenient for arrival passengers. The escalators make it very easy for passengers to transfer to different floors. There are twelve washrooms in the waiting room, and another twelve near the ticket check points, including two for the disabled. On the western section of the waiting room, passengers can enjoy the beautiful scenery of the Jiaozhou Bay Bridge. The station has the east and west squares, with hotels, restaurants, and shops around them. While several bus stops are found at the northern section of the east square, taxi stand is located at Level B1 of the east square. The Qingdao Cangkou Coach Station is 1.2 miles (2 kilometers) away east of the railway station, from where one can travel to cities like Jinan, Penglai, Yantai, and Rizhao. Ticket office can be found in both squares, the east and west ticket office with eight and six counters respectively. There are also 44 ticket dispensers in the two ticket office. 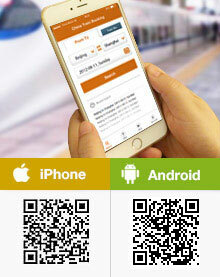 Passengers can exchange their tickets or obtain a refund at the ticket counters conveniently. The north station operates trains to/from Beijing, Harbin, Changchun, Jinan, Shanghai, Xi'an etc. By metro: Passengers can take line 3 to get there directly. 1. Take bus No. 23 (Loop Line), 24, 112, 113, 118, 120, 207 (Loop Line), 325, 603, 908 and get off at the east square of north railway station. 2. Take bus No. 23 (Loop Line), 24, 112, 113, 118, 120, 207 (Loop Line), 908 and get off at Canghai Road. It takes 30 minutes and costs CNY 60 from Qingdao Railway Station. It takes 30 minutes and costs CNY 60 from Qingdao Liuting International Airport. Take bus No. 325 and get off at Zhan Qiao, and then walk for a while. Walk to the northeast to Zhenhua Road West, take bus no. 22 and get off at Xingcheng Road. Walk to the north to Ban Qiao Fang and take bus no. 302 to Nanhai Road, and then walk to the beach. Take bus No. 207 (Loop Line) to Shaoshan Road, transfer to 230 and get off at Government of Laoshan District, then walk to the place. Take bus No. 325 to Hai’an Road stop, and then transfer to bus No. 15 to Zhongshan Park. 1. Take bus No. 118 and get off at Zhaohong Road, transfer to 613 or 917 and get off at the airport. 2. Take bus No. 120 and get off at Liu Ting, transfer to 613, 767, or 917 and get off at the airport. 3. Take bus No. 112 or 113 and get off at Xingcheng Road, transfer to 305 and get off at the airport. 4. Taxi from the railway station takes 30 minutes and costs CNY 60 to the airport. How do we get from Sheraton Qingdao Jiaozhou to Qingdao North Railway station? It will be quite inconvenient for you to take bus to the north station, for there is no direct bus, and you have to change buses for three times. So you can take a taxi there directly which costs about CNY130 one way. Yes! Over 50 rides a day from Qingdao North to Weifang. elevators to platform Qingdao station subway? I will arrive by train in Qingdao. I can choose Qingdao North or Qingdao Station. To transfer down to the subway station platform, is there an elevator/lift? I can't manage escalators. Thanks. The station to use depends on the ride you choose. There is lift in subway station, but I think they are not directly connected with the railway station platform. To use the lift, maybe you need to go out of the railway station by using lift and then again using it to enter the subway station. If you need any help of using the lift, you can find the staff at platform for help. Wish you a good luck! station to my hotel (Qingdao Farglory Hotel ,No. 26 Xianggang Zhong Road,Shinan District & how much does it cost ? You can take the subway line 3 from the railway station to Wusi Square, exit C. The hotel is around 800m away. The subway would cost around CNY3 or 4 per person. Transportation from Qingdao North Railway station to Hotel . How to get from north railway station to Qingdao Farglory Hotel No.26,Xianggang Zhong Road,Shinan District .How far is it ? What about by Taxi,how much does it cost ? You can take subway line 3 from the station to Wusi Square, exit 3. Thehotel is around 800m away. The distance is around 18km, by subway around 40min. If you take a taxi, it should cost around CNY50.